Gareth Bale is set to sign a new bumper contract with Real Madrid. The Welsh winger is currently on a massive £300k-a-week contract with Real Madrid. But with strong rumours of Manchester United being interested in signing Bale emerging, it doesn’t come as a surprise that Real Madrid are going great lengths to secure his stay at the Spanish capital. 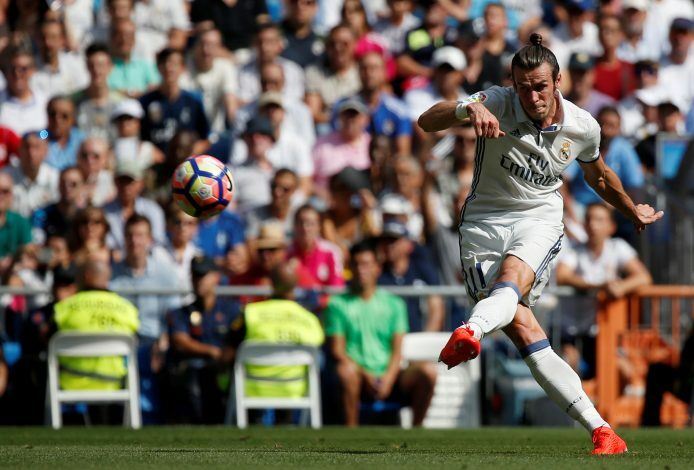 Bale began his professional career at English side Southampton, playing at left-back and earning acclaim as a free kick specialist. He moved to Tottenham Hotspur in 2007, for an eventual £7 million fee. He endured a difficult start to his Tottenham career, and at one point was almost sold. He eventually turned everything around and became Tottenham’s best player. He moved to Real Madrid on transfer deadline day in 2013, for the then world record fee of €100m. The Welsh hero has won two UCL titles with Real Madrid since then. The 27-year-old had an excellent 2015-2016 season with Real Madrid and Wales, winning the Champions League with Real Madrid and reaching the semi-finals of the Euros with Wales. According to English publication The Guardian, Bale’s new contract would put him in the same wage bracket as Cristiano Ronaldo and Lionel Messi. The Guardian speculates that his new release clause would be set at €500m, enough to keep the Red Devils at bay. Such clauses are common in Spanish football, and according to the Real president Florentino Pérez, Ronaldo’s is worth €1bn. “In the case of Cristiano, it’s €1,000m,” Pérez told Cadena Cope radio station last year. Bale is expected to be putting pen to paper on this massive deal as soon as the legal fine prints are sorted out. Bale is not the best player, it’s just a waisting of money, you have Memphis, martial and rashford i think they will power!